Lean Reflections: Advance Storage Products is Lean! Here at Lean Sensei, it simply warms our hearts to see our clients working Lean. Today we would like to direct the spotlight and applause to Advance Storage Products! For Advance Storage it all began with a single Greenbelt and it is clear that they've definitely set a firm foundation and are headed towards even greater success. Based out of the United States, Advance Storage provides quality racking products and service. This organization has a commitment to delivering excellence, being adaptable and maintaining long-term stability in addition to other goals. Depicted below is the 5S Audit Board. It is reviewed on a regular basis, accountabilities are clear and the board is accessible to all who need to see it. Nothing unneccessary (note there's even only a single marker) is on the board. 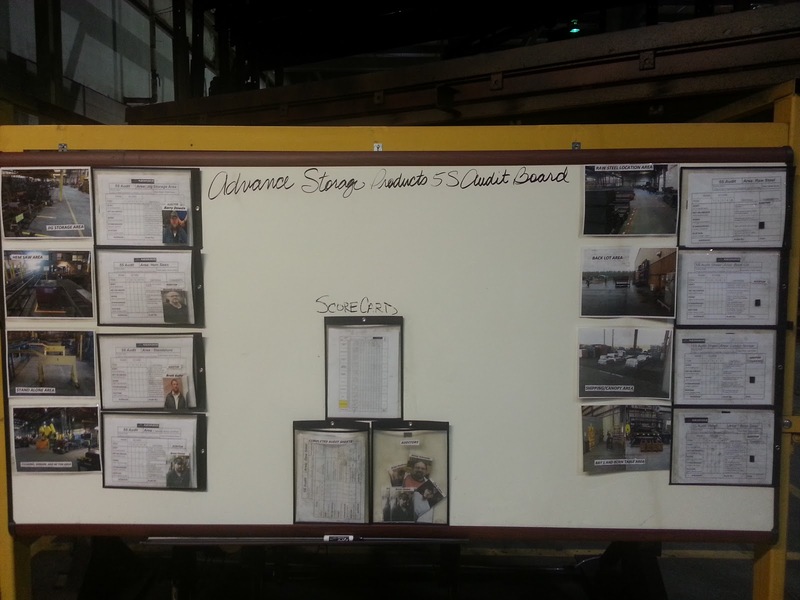 This seemingly simple tool has helped Advance Storage Products stay on top of key deliverables for that work area and at the same time ensures successes are showcased. Way to go Advance Storage Products!